While the media landscape is changing, it doesn't mean that traditional media is a relic of the past. In fact, you can see its influence has translated across several digital channels today. To name one, digital video evolved out of online demand presented by a shift in video consumption habits from television. It is becoming an increasingly important medium for automotive advertising as television used to be one of the main ways their message was communicated to the masses. While some of the ad formats are the same, the medium in which the advertising is disseminated is changing and the automotive industry must adapt. With stiff competition, automotive manufacturers and individual dealerships are wondering how they can stay ahead of the curve. In the past, car shoppers made multiple visits to dealerships learning about make and models, taking test drives and negotiating costs. Today these activities occur before they even hit the lot. Automotive manufacturers’ websites offer spec guides, user reviews can be found on YouTube and MSRPs (manufacturer’s suggested retail price) are readily available through a Google search. During the moments your potential customer is in research mode, it is important your dealership has an online presence to persuade those who see your ad to come into your dealership. In this research phase, the key channels to consider are video, display and search. It is simple, generally the first place potential car shoppers defer to for research are search channels. As they narrow down their search to specific makes and models you want to ensure your dealership is top of mind as they look for vehicles that will fit their current lifestyle and needs. 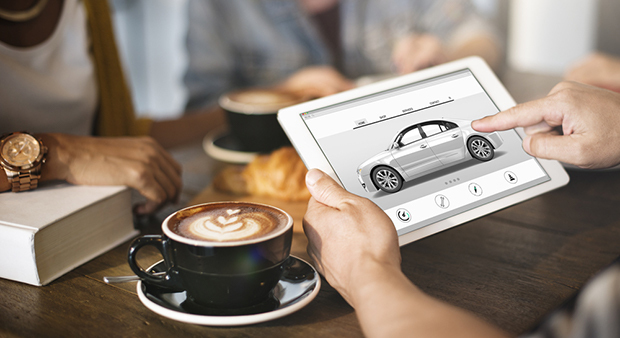 Provide car shoppers with relevant content exemplifying the advantages of buying your auto make/model through video then reengage them with display and mobile. Research shows there is a high correlation with dealership visits reaching car shoppers in the initial research phase compared to when they are closer to their final purchase2. Additionally inclusive of their findings was prospective auto buyers who were researching did so on a mobile device. An “always on” approach is essential as consumer behaviors change. However, you can be strategic with your investment. For instance, consider a heavier media investment during the summer and holiday seasons knowing these are the time periods most car shoppers are looking to make a purchase. Being there is integral to ensure you have a solid presence when your potential customer is in market. It’s critical that you are reaching the right audience on the right channel during the right moment with the right messaging. I know, that is a lot of “rights,” but if you can accomplish that, you can consider a car sold. A Google study2 found that 69% of people who use YouTube while buying a car are influenced by the content watched, surpassing the influence of TV, newspapers or magazines. Furthermore, the same study found time spent watching auto video that contained content such as vehicle test drives, features/options and walkthrough of interior/exterior have increased 2x YOY from 20152. When considering this statistic make sure the content you are driving to auto buyers aligns with what they are looking for. Mobile activity does not stop in the research phase; it continues up until the potential customer makes a visit to the dealership. What can be drawn from these findings is that an opportune time to be highly visible is when potential customers are visiting another dealership to increase your potential in driving a customer from your competition’s lot to yours. Being useful and getting in front of prospective buyers with a make/model they didn’t even know they needed increases those chances even more. The top action people perform with their phones while on the dealership lot is confirming that they are getting a good price on a vehicle2 by searching for inventory updates and local incentives. If you are trying to drive prospective buyers to your dealership you will want to consider messaging surrounding costs and incentives delivered via mobile channels. Cognitive fluency is the principle based on the notion that humans tend to prefer things that are easy to understand and familiar. This is where the importance of creative and messaging comes into play. If you were to look at five different dealership ads and cover their logos, unless you were a car aficionado, you likely would not be able to tell which advertisement belonged to what manufacturer. Not only can you not tell the difference between car manufacturers, the message typically does not translate to the user as these ads typically contain too much text that is so small it is illegible. In that event, they are likely to miss or pass over your ad. How you will stand out is by going back to the principle of cognitive fluency. If you simplify your ad making it easier to understand, keeping the imagery and colors similar to other advertising elements you are using, you’re that much closer to winning your customer. Diversifying your strategy with digital components will assist in ensuring you are reaching the right individual with information that is applicable to them in their moment of need. Along with traditional channels, this will make your media execution come full circle guiding your customer through their journey to buying a car. If you would like to know more, visit our success stories page, or click here to reach us.